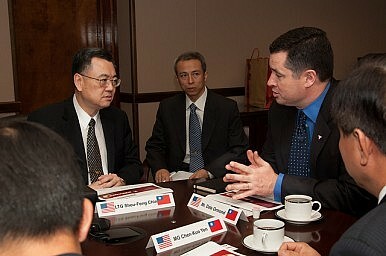 U.S. Army, Taiwanese officials discuss science, technology collaboration. Since the U.S. announced its rebalance to Asia in 2011, Taiwan has received relatively little attention compared to other countries in the region. Yet some recent symbolic events suggest that this might be changing. In contrast to the improving defense diplomacy activities between the U.S. military and its regional counterparts under the rebalance, Taipei has been clearly excluded by its international isolation. That may now be changing. In late May, for instance, a brigade commander of the Republic of China (ROC, the official title of the government in Taiwan) Marine Corps led a delegation to attend a U.S. Marine Corps conference on maritime and amphibious operations in Hawaii. At almost the same time, General Yen De-fa, Chief of General Staff of the ROC Armed Forces, and Admiral Lee His-ming, Taiwan’s Navy commander, attended the inauguration ceremony for new commanders of the U.S. Pacific Command and the Pacific Fleet at Pearl Harbor in Hawaii. In June, the ROC Army’s 601st Aviation and Special Operation Brigade, based in Taoyuan, and the Hawaii-based U.S. Army 25th Combat Aviation Brigade established a sister-unit relationship. The ROC will send a mobile infantry platoon to receive joint training with a U.S. brigade in Hawaii. Open interactions like this have been quite rare since 1979, when Taipei and Washington severed official ties. In fact, bilateral military ties have recovered to some extent in the post-Cold War era, especially since the missile crisis of 1996. Taiwan sends military personnel to receive training, usually related to arms deals, and their American counterparts will attend some activities such as the annual Han Kuang exercises. Still, public activities have remained infrequent. These events could demonstrate that the U.S. may now be able to consider the final piece of the rebalance puzzle, Taiwan. Among the countries associated with the rebalance, Taiwan is certainly not the weakest, but it does carry the greatest risk. Although Taipei’s military strength outweighs that of the Philippines, Malaysia or Vietnam, those Southeast Asian countries only have limited territorial disputes with Beijing. In contrast, China claims all of Taiwan, and the relatively short distance between them makes it easy for the former to project military power over the latter. China has many options for targeting Taiwan, including ballistic and cruise missiles, and the island is well within the sphere of China’s anti-access/area-denial strategy. Despite these serious challenges, Taipei has struggled to bolster its defense capability, failing to secure major arms deals, such as submarines. A limited defense budget and rising human costs associated with the transformation to an all voluntary force has constrained Taiwan’s defense investment. Rising numbers of Chinese visitors to Taiwan has raised the likelihood of sabotage. Continuous Chinese espionage has also critically weakened Taipei’s military capability. Politically, unlike normal sovereign states in the region, Taiwan’s unique statehood has created an ideal domestic environment for China to try non-violent offensives. The local Chinese cultural heritage and the ROC regime’s Sinicized nation-building measures since 1945 have resulted in a Taiwanese society dominated by Chinese culture. Booming cross-Strait economic ties since the 1990s created a strong pro-China political force that eventually took power in 2008. This has enabled Beijing to exert more influence on Taipei than ever through a range of open policies, especially the Economic Cooperation Framework Agreement, initiated by the latter. China is now Taiwan’s largest trade partner, in terms of both imports and exports, as well as its largest debtor. Given that Beijing has credibly used economic tools to pressure Japan and the Philippines, it would be no surprise for it to take similar actions against Taipei. Undeniably, the China-friendly policies of the present ROC administration have become unpopular, especially after the Sunflower Movement last year, and some anti-China emotion is brewing in Taiwan, as evidenced in the rising percentage of the population claiming Taiwanese rather than Chinese identity in recent polls. The opposition Democratic Progressive Party (DPP) is the frontrunner ahead of the presidential elections in Taiwan next year and would form a government less well disposed towards China. Nevertheless, given the potential economic and political blowback, the agreements between Beijing and Taipei for cross-Strait integration will not be easily abrogated. The DPP’s candidate, Tsai Ing-wen, has emphasized her respect for the “status quo.” In summary, Taiwan’s political and economic vulnerabilities, not evident in any other U.S. rebalance partners, are unlikely to improve in any meaningful way in the foreseeable future. Strategically, Taiwan would be significant for the U.S. rebalance. Before Taipei adopted a China-friendly position in 2008, Beijing was preoccupied with the Taiwan issue and did not impose significant strategic pressure in the East and South China Seas. In other words, a robust Taiwan could pin down some of China’s attention and resources. Unfortunately, after seven years of opening westward, Taipei is unlikely to play the same role again, particularly given its comprehensive vulnerabilities to Beijing. If the U.S. is serious about balancing China in the Taiwan Strait, the recent symbolic actions will be insufficient. Major measures, such as an arms deal involving sophisticated weapons systems, are needed. However, merely strengthening Taiwan’s defense capability in itself is of limited significance. As long as Taipei is unable to reduce its economic dependence on Beijing, China will always be able to use its leverage to effectively influence Taiwan. In sum, Taiwan’s location and importance to China could be reasons for the U.S. to include the former as the final element of its rebalance policy. However, Beijing’s overwhelming influence over Taipei may outweigh any U.S. shift in approach. That reality combined with presidential elections in both the U.S. and Taiwan in the next year may well preclude any real progress in bilateral military interactions in the near future.